I personally have fallen completely in love with this prototype that just came out called "Lillian" that I found at Bountiful Baby. To make matters worse with my possible addiction to these sweet little faces, I am smitten with the work that was done on her by Samantha Rose Harker at Sam's Reborn Nursery. I think she may be by far one of the best artists out there. Not to say there are not more amazing artists. But I think she has her craft honed in! I can only aspire to be like her. It's no wonder Bountiful Baby ran out of the dolls immediately. Unless they just never had them in stock! That could be the case too as I don't know enough about the industry but I wanted her from day one of my reborn interest. The fact that Samantha or Sam can "paint" hair that looks real rather than rooting it, is just insane in the membrane. Look how careful and fine her strokes are. The hair is stunning just like the quality of her dolls. 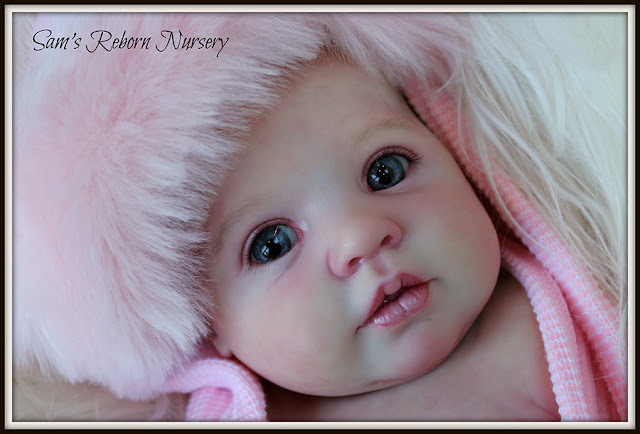 I just had to blurt it out, because I am looking at her prototype of Lillian done for Bountiful Baby and her prototype pics made me want to buy her! Wowzers! She is so very impressively realistic! The doll is just top notch and who ever got her, you should know, I am so jealous! I am buying this kit when it comes out, maybe even two (I am praying I have money saved up for her). And I just might keep the baby! Who knows what might happen after I paint "Lillian"! I swore I would never keep them. But I just might go back on my promise! Have fun reborning, loving your reborn and visit me regularly! Sending Out Lots of Love!